Get brighter looking skin using the ?VLCC Insta Glow Gold Bleach? . The Insta Glow Gold Bleach gold bleaches the facial hair to even the skin tone in a simple three-step action. The energy stored in the precious element gold with its wholesome curative powers to the skin makes the skin look radiating and glowing. The bleach powder gets absorbed with the cream, and the pre-and post bleach packs are good on skin which gives an insta glow on it. This product contains a Pre-bleach gel, bleach cream, activator and a post bleach pack. The gold bleach helps the skin look youthful and fair, with a golden glow in a three-step action. Bleaches facial hair to the skin tone perfectly. Removes uneven patches and reduces the appearance of blackheads. 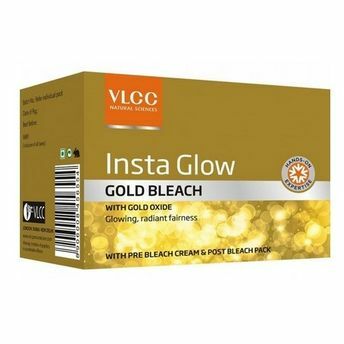 Alternatively, you can also find many more products from the VLCC Insta Glow Gold Bleach range.